Hilde wrote in to ask about St Malo and Dinan bike routes in Brittany. Every June we like to take our bikes, hop on a ferry and spend a couple of days cycling in France. Next, we want to go to St Malo as I had read that there are smashing cycle routes round Dinan. I have found a voie verte Dinard-Dinan but it is only about 23km. We could manage a bit further! Is there any way that we could cycle in a circular route say Dinard to Dinan then cross the Rance and cycle back up the east bank to St Malo? We would be happy to buy a book if it could show us more routes! We have two days, we could take a train, St Malo to Rennes then cycle back from Rennes, but how would we find a map for there? I hope you can help please! Thanks for your email - I hope you have found my website of some use. From this forum exchange, it appears the eastern side of the Rance may be problematic. If you are regular visitors to northern France, I can recommend a few books that are written by experienced cyclists and walkers, and that feature excellent cycle routes in Brittany and Normandy, plus handy maps. Cycling Northern France (UK link, US link) covers several routes in Brittany, including a coast-to-coast route and one west from St Malo, towards Mont St Michel. Brittany's Greenways (UK link, US link) – covers all the major greenways, and can be used to link them. 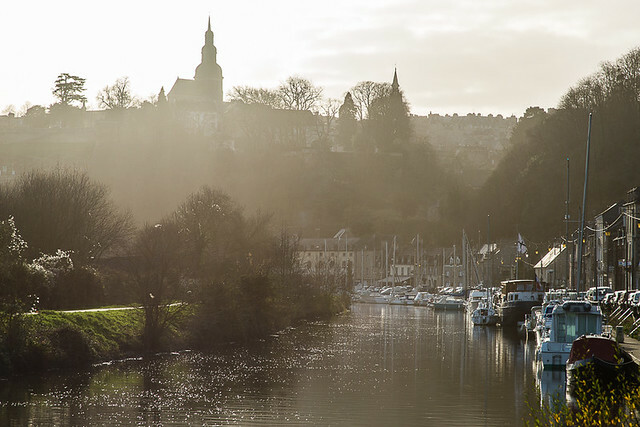 The Nantes-Brest Canal - A Cyclist's Guide (UK link, French link, US link) – the Nantes-Brest Canal this may be to far south for you but it's a great route and may provide some inspiration for a later trip). If your French is OK, then also check out these guides. Brittany Ferries also lists a circular route on their website which is popular with cross-Channel cyclists. It's 190 miles, though you could tailor it to your needs if it's too long. IGN's regional Brittany map might be of use, too, woth your planning. See also our articles on Dinan and St Malo (these are more of an overview - it sounds like you already know the area quite well - but I've included them here just in case they are of use). There are more ideas in the organised tours section - some Brittany self-guided options if you fancy extra help with the planning. For accommodation, zoom into our map. I hope that helps - please drop me a line back if I can help further. Lyn – just what I needed, thank you! I was getting so frustrated with not finding enough info. I will most certainly get the books you mention. We cycle to northern France every year, just for a short break but intend to do some longer rides in the future. We are in our 60s, so river/canal rides suit us best as there are few hills! We want to cycle round the Loire and we have read that there is a wonderful route along canals in Burgundy. Thank you again, we are delighted!